The heaped ruins tell stories heard only by shadows and ghosts. through drawing rooms drowning in warmth and dreams. All that’s left are tuneless memories. behind the ashen secrets of these silent eyes? and the thick, heavy snow? and they lost feeling in their feet? in a cold, naked silence. told to a night of restless dust. leaving nothing behind but the silence of ruins. but a memory and a shadow. Emily Drumsta is a Ph.D. student and Jacob K. Javits fellow in Comparative Literature at UC Berkeley. Her research interests include modern Arabic poetry, literature in French and Arabic from the Maghreb, postcolonial theory, and translation studies. 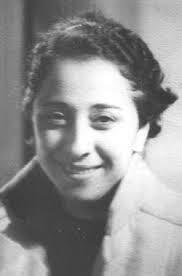 Her translations have previously been published in Jadaliyya and Circumference magazine. Previous Which Arab Authors Are in the ‘Running’ for This Year’s Nobel Lit Prize? Wow. This was so moving. I haven’t heard of this poet before but now that I’ve had a taste, I’m off in search more her translated poems. I hope there are more. And I think Emily’s working on more. Oh brilliant! You didn’t have to go to such trouble but thank you! This brilliant poem by Nazik Al-Mala’ika is reminiscent of the war poems of Wilfred Owen and Siegfried Sassoon; it’s vivid, melancholic and reveals so much about human nature in the worst of conditions.